One in four voters during this year’s Stadium of the Year competition included this stadium in his vote, resulting in 8,103 votes for Husky Stadium and a massive number of 29,794 points. A year ago this would have guaranteed first place, but with the record-breaking 27,851 votes this year, Husky Stadium lands in third position. Almost half of the 8,103 people voting for Husky Stadium ranked it with the highest 5-star note (or five points). 855 votes gave it 4 stars, 1,074 – three, 1,094 – two and 1,109 – one. Husky Stadium is one of the largest grounds nominated this year after it was completely rebuilt. 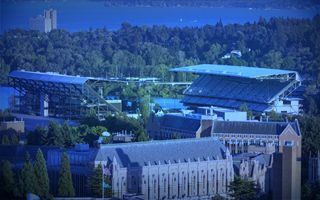 The monumental stadium at Seattle’s University of Washington Campus is the first ever NCAA venue to be nominated for Stadium of the Year title and reached its very high place despite very traditional approach. Or was it thanks to this historical atmosphere? Read more about it in our presentation.